Toni and her two daughters in front of her new home. 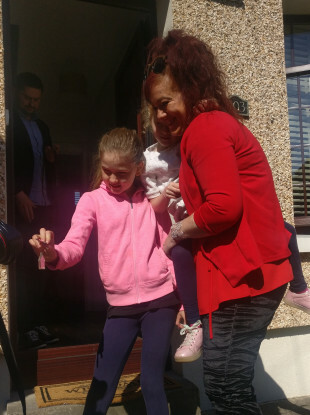 A MOTHER AND her two daughters who have spent the last two years living in a single hotel room today moved into their new home in Dublin – the first delivered in the country as part of a government leasing scheme. Last year, former Housing Minister Simon Coveney said he was confident that the scheme could deliver 800 houses in a year. To date, just nine have been delivered across the country. The first home in Dublin will be lived in by Toni Reid (42) and her daughters Ruby (9) and Indie (5). The family became homeless in early 2016 after a relationship breakdown. They moved back to Dublin from Louth and were unable to find anywhere affordable to rent, so they started sofa-surfing with other family members. The family moved around a number of homes before declaring as homeless with Dublin City Council. They were given a list of hotels in which they could self-accommodate – meaning they would find a hotel to live in themselves. Eventually, Toni moved into a hotel in Castleknock in June 2016 – she and her two daughters have been there since. “It’s been horrific,” Toni said today. “It was very tough. Not being able to cook and I’ve been absolutely broke and smashed. Not being able to cook dinners, not being able to wash clothes. It’s very warm and cramped and you can’t have your own bed. It’s clammy and warm. It’s noisy. When she became homeless, Toni was forced to leave her job so that she could take care of her children and try to find somewhere to live. She said the two years had been very hard, but that the hotel staff had been good to her and her family and they had had good times as well. “It’s been mentally challenging – hell,” Toni said today. “My daughter had a communion last year and I had to borrow a house. My friend lent me her house for her communion. But I’ve had good times, too. The hotel have been very good and people have been very good and I would have been lost with my family support. Today, she was given the keys to a new home on Kylemore Road in Ballyfermot, the first to be delivered under the government’s Repair and Lease Scheme. “I’m just ecstatic at this – I’m still in shock,” said Toni. Absolutely… I thought it was a joke when I heard it. Coming from a hotel back into a home… I’m very, very grateful. The home is being managed by the Peter McVerry Trust and is leased from the owner for 20 years. Former Housing Minister Simon Coveney launched the Repair and Lease Scheme in early 2017. It is part of the government’s Rebuilding Ireland Housing Action Plan. Under the scheme, the owners of run-down vacant properties can be paid up to €40,000 for refurbishments to be carried out. The owner then leases the property to a local council or Approved Housing Body charity for a set number of years (usually 10-20) and is paid up to 92% of the market rent for the property. Launching it last year, Coveney said that he was “confident that the initiative can deliver up to 800 homes this year”. Minister Murphy confirmed today that a total of just nine homes have been delivered under the scheme across the country. In response to the failure of the scheme to deliver almost any houses, Murphy announced in February a raft of changes aimed at enticing owners to lease their properties. These included a reduction in the minimum lease term required from 10 to 5 years, additional funding above the €40,000 in certain cases and increasing the percentage of market value rent to be paid to landlords. €32 million has been earmarked for the scheme this year. The government has said – again – that the scheme has the “potential to bring 800 empty homes back into use this year”. Speaking today from the home, Murphy said that he hoped the changes would mean more property owners would consider the scheme. “We didn’t see the take up that we hoped we would have seen in the first quarter, second quarter that this scheme is in operation,” he said. We hope [the above] improvements are going see far more people entering into the scheme. Murphy said that 600 properties have been inspected and approval for the scheme has been given to about 350 to date. “So those numbers now are starting to come through the system,” he said. In a statement today, Pat Doyle, CEO of Peter McVerry Trust, said the charity was “absolutely delighted” to deliver the home. “We promise that this will be the first of many. We have a pipeline of 23 that we believe we will deliver in counties Dublin, Kildare, Louth and Limerick this year,” he said. Minister Murphy also fielded questions on the recent issues around the categorisation of homeless figures. It was revealed late last month that local authorities had been told by the Housing Department to remove certain families from their monthly homelessness figures. The Housing Department states that families living in council or private housing stock were miscategorised as homeless, but the move has prompted fierce criticism from opposition politicians and officials in the NGO sector. Murphy said today that “there was no dispute” over the figures, and that people had been added in error as homeless when they were not. Two reports commissioned into the categorisation of homeless people are due on the minister’s desk over the next week, and he said he will act on the reports when they are published, which should be in June. Email “'My daughter had a communion last year... my friend had to lend me her house'”. Feedback on “'My daughter had a communion last year... my friend had to lend me her house'”.